When wedding planner Anne Hawthorne meets George Laurence, she thinks she's found the man of her dreams. But when he turns out to be a client, her "dream" quickly turns into a nightmare. Will Anne risk her heart and her career on this engaging Englishman? George came to Louisiana to plan his employer's wedding and pose as the groom. But how can he feign affection for a supposed fiance when he's so achingly attracted to the wedding planner? And what will happen when Anne discovers his role has been Stand-In Groom only? Will she ever trust George again? Can God help these two believers find a happy ending? This was a sweet, if at times predictable, love story about two believers meeting under non-ideal circumstances. The summary kind of gives a lot of the story away, more than I would have liked to know before I read it. There's something to be said about a book where two people in love take their relationship slowly and prayerfully. And by slowly, I mean that they don't move further than holding hands for a loooong time. But the emotions were very well- described and the relationship/attraction was very well-developed. Both George and Anne go through a period of personal growth throughout the book. I love it when characters grow...to me there is nothing worse than characters who stay stagnant and resistant to change. This was the first book by Kaye Dacus I have ever read, and I'll definitely be back for more. 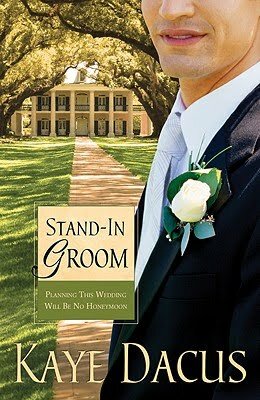 What's going on with the groom's head on the cover? I want to see his eyes too! The supporting characters were well-written. That added a lot to the story for me. Cute review! You're right, I want to see his eyes.